Building new parking garages in downtown Menlo Park will cost tens of millions of dollars while clogging streets with more traffic. But that’s what municipal leaders are seriously considering in an attempt to boost business, apparently oblivious to modern parking policies that have paid off for other Peninsula cities. Last month, the Menlo Park City Council voiced support for building a new five-level parking garage on top of one of the city’s surface parking lots, called “parking plazas.” The project is estimated to cost between $29,000 and $43,000 per parking space — adding up to several million dollars. The council is also considering extending time limits for downtown parking spaces, having concluded that the current time limits on free parking discourage shoppers from visiting businesses on Santa Cruz Avenue. Menlo Park maintains 1,595 free parking spaces in its downtown core (the area bounded by El Camino Real, University Drive, Oak Grove Avenue, and Menlo Avenue). The current time limits, set in 2011, are 15 minutes, one hour, or two hours, depending on location. In some spaces, drivers can exceed the two-hour limit by paying $1 per hour after it expires. Also available are $10 daily permits and $592 annual permits. The council proposed doubling the time limits on the 15-minute and one-hour spaces and extending the two-hour spaces to a three hour limit, with the intention of giving customers arriving by car more time to spend at Santa Cruz Avenue businesses. “We have the foot traffic, and then we take a stick and chase [customers] away as soon as they finish lunch,” said Mayor Catherine Carlton of the current time limits. “I just want to make it as easy as possible for families and our seniors to patronize our local business and our restaurants downtown,” said Council Member Ray Mueller, who described the current time limits as outdated, based on parking data collected in 2009 during an economic recession. But what’s really outdated is the idea that giving away more free parking will be good for downtown. Time limits are a blunt and ineffective means to ration access to parking. For years, UCLA professor Donald Shoup, the nation’s leading expert on parking policy, has counseled cities to instead manage parking by pricing it properly, so that some spaces are always available. By extending time limits, Menlo Park will only make it harder for driving shoppers to find a parking space during peak hours, causing them to spend more time cruising for spots and clogging downtown streets. Anticipating this problem, the city is now considering building a new parking garage. 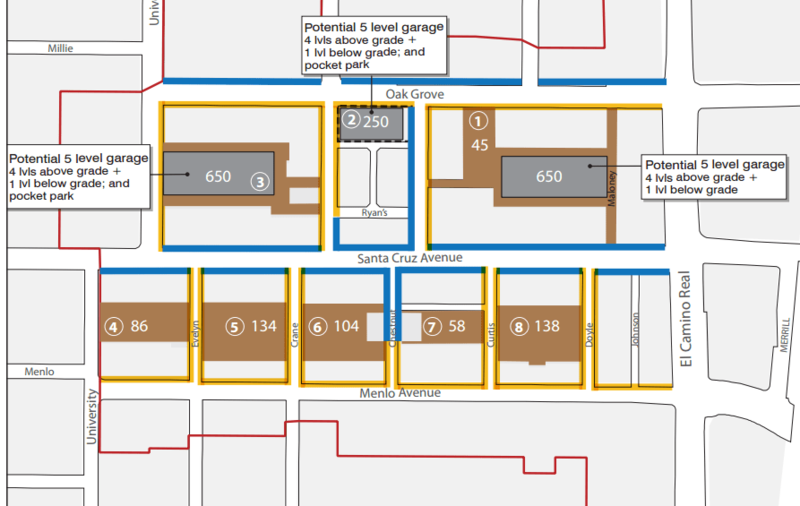 Menlo Park’s 2012 El Camino Real & Downtown Specific Plan proposed building five five-level parking garages on the city’s parking plazas over the next 20 years. At the time, the estimated construction costs ranged from $11 million for a 250-space garage to $21 million for 650-space garages. Those recommendations include setting hourly prices for downtown parking spaces to keep a certain number of spaces free, while removing time restrictions entirely. Neighboring Redwood City has used this strategy since 2005 to manage 2,774 on-street and off-street parking spaces in its downtown, with rates currently set at $1 per hour in the city’s downtown core. Menlo Park has not yet studied this option in detail. New revenues from metered parking in downtown Menlo Park could be used to fund alternatives to driving, such as free or reduced-price transit passes for downtown employees or infrastructure improvements, including wider sidewalks and better bicycle parking. Other programs to reduce demand for car parking could be funded through a Transportation Management Association (TMA) of downtown businesses, similar to those now established in San Mateo and Palo Alto. The next step of the downtown parking garage project is a $200,000 feasibility study, recommended by the city’s Planning Commission in January to be included in its 2015-2020 Capital Improvement Plan [PDF], scheduled for City Council review in May and June. Menlo park is not SF. There isn’t much of an alternative to driving, and in that case, garages are superior to on-street parking as they take up smaller footprints and leave space for other uses. Complaining about “clogging streets with more traffic” is silly and right out of a NIMBY playbook. Eh, it’s Menlo Park. The families and seniors Councilman Mueller wants to attract to local businesses aren’t going to start taking non-existent public transportation, and the area doesn’t have nearly the density to support Muni-style transit all day every day. There’s a lot of value in managing parking spaces and establishing demand management programs, but Menlo Park isn’t going to magically turn into a transit-oriented community (and its residents don’t seem to want that), so it has to make plans grounded in its reality. This proposal isn’t about ruining downtown with parking garages. It’s about replacing existing parking lots with larger garages. Not ideal, but it’s not bulldozing playgrounds either. Palo Alto and Redwood City have both added parking garages over the past 30 years and that has greatly improved both of their downtowns. The lack of parking, as well as low height limits which block multi use buildings, have kept Menlo Park stuck in 1965. 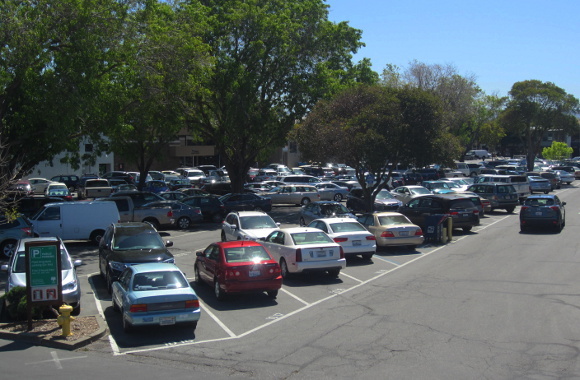 Boone is right to cite Shoup … Menlo Park should try pricing its parking correctly. More garages and/or time-limits won’t be necessary that way. As Menlo seems ignorantly hell-bent on proving, making a scarce and costly resource such as parking available for “free” is very expensive in more ways than are immediately obvious to the average businessman or policymaker … as anyone can read about in Shoup’s seminal “The High Cost of Free Parking”. There’s a solution for all of Menlo Park’s transit woes everyone seems to overlook: a fleet of bulldozers. The entire city is a transit ghetto and there’s really no other way to bring it out of the 1950’s. Start over, and do it right this time. Downtown Palo Alto is a mess. Horrible traffic, creepy homeless meth addicts, and most interesting local businesses have been driven out. If you want a cheesecake factory, American Apparel, and whatever chain store du jour, then emulate Palo Alto. Only a competing development plan has a hope of improving this situation. Suggesting less or no development is simply a non-starter to leaders with money to spend. The lure of literally creating a concrete result and putting people to work is too great. This is something Palo Alto didn’t bother with in their parking garages so cyclists have to cram their increasingly expensive rides in the increasingly crowded parklets. Doing that in the rain with groceries is off-putting to committed cyclists, much less newbies. Making cycling to downtown Menlo Park so deluxe (at least by U.S. standards) would give Menlo Park a way to leap frog Palo Alto on its way from car-centric 1965. It would give Menlo Park a unique and modern shopping experience that would distinguish it from rival business districts. Last but not least, it might encourage more cycling to downtown. Haven’t been to Cheesecake Factory in years, don’t shop American apparel. But I remember what it was like in late 70s, and it was dead. A couple smoky bars to avoid. The New Varsity where the waiters at the cafe were so stoned they’d forget to bring you your order and a downtown that felt deserted at night. Much like MP still does. There are a couple of reasons why a parking garage would be helpful in Menlo Park. First of all, there is a relatively new Downtown Plan that provides more zoning to build housing and mixed-use buildings. But with small lots, it would be impractical for each development to build its own parking. It would make more sense to consolidate parking for new buildings into a parking structure. Also, a parking structure would make it easier to remove parking from streets and add bicycle lanes instead. Agreed that by giving away more free parking, Menlo Park is encouraging driving and traffic, and increasing the eventual bill to the city and developers for building a parking structure to cater to people who expect to drive. To folk who say that Menlo Park has no options other than driving – have you been to Downtown Menlo Park? The downtown is next to a Caltrain station and has 15 minute bus service along El Camino. Much of the city is flat, the weather is perfect, and many visitors to downtown are coming from less than a mile or two away. Sure, alternatives to driving won’t work for everyone, but if Menlo Park improved transit incentives for workers, promoted bicycling and improved bicycle infrastructure, there are likely many more who could leave cars at home. 1) What? Menlo Park has a pretty high bike mode share, and modulo El Camino has some pretty good infrastructure. They have removed car parking in order to better service the flotillas of kids who ride to school. 2) Induced demands is real, and caused by parking garages. And of course this change is due to parking garages. Not the hundreds of new companies now headquartered in Palo Alto. They come together. No parking, in car dependent suburbs means no jobs. I love public transit. Rode Caltrain for 15 years, but buses are not enough in the ‘burbs and not everyone likes to commute on a bike (I do). Should this post have a “sarcasm” or “irony” symbol affixed? This isn’t China, where, from what I’ve read, the government can do things like that and the citizens have no recourse.